Somaliland: Waddani Party Leaders Meet With Turkish Envoy. 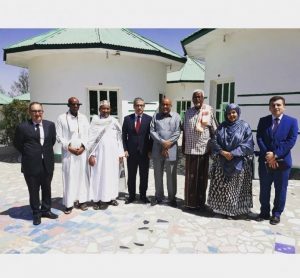 Hargeisa,(Qaran news)-The leaders of the Somaliland Waddani Party met with Mr. Oglan Baker, the new Turkish envoy tasked with attempting to restart the stalled talks between Somaliland and Somalia pertaining to the future relationship between the two countries. The chair of Waddani, Abdirahman Mohamed Abdillahi “Cirro” and other senior party leaders held a long and fruitful discussion with the Turkish envoy, Mr. Baker, regarding the future plans for Somaliland and Somalia talks, as well as, other local issues such as the forthcoming parliamentary elections, the paucity of Turkish grants to Somaliland and the continued bilateral relationship between the two countries. The Turkish envoy is expected to meet with members of the UCID, Non-governmental bodies and other civil society organizations.